Diseconomies of scale are when production output increases with rising marginal costsFixed and Variable CostsFixed and variable costs are important in management accounting and financial analysis. 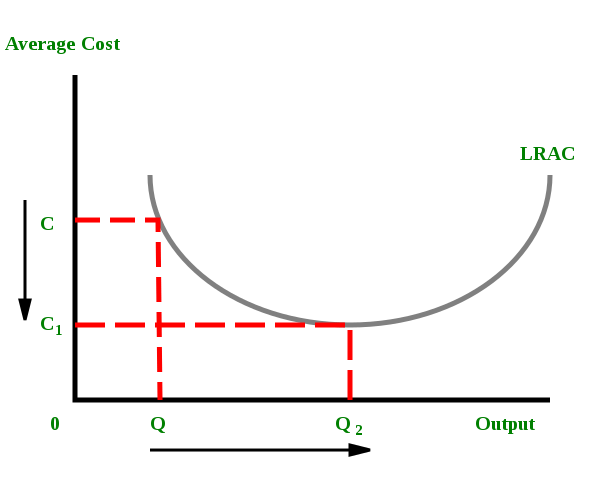 Fixed costs do not change with increases/decreases in units of production volume, while variable costs are solely dependent on the volume of units of production. This guide teaches an analyst the fixed vs variable cost methods, which results in reduced profitabilityProfitability RatiosProfitability ratios are financial metrics used by analysts and investors to measure and evaluate the ability of a company to generate income (profit) relative to revenue, balance sheet assets, operating costs, and shareholders' equity during a specific period of time. They show how well a company utilizes its assets. Instead of production costs declining as more units are products (which is the case with normal economies of scale), the opposite happens, and costs become higher with the production of each additional unit. Consider the graph shown above. Any increase in output beyond Q2 leads to a rise in average costs. It is an example of diseconomies of scale – a rise in average costs due to an increase in the scale of production. Many businesses face the challenge of handling the pressure that follows after an expansion, which translates into increased workload and hence more clients to serve. Business growth by way of mergersMergers Acquisitions M&A ProcessThis guide takes you through all the steps in the M&A process. Learn how mergers and acquisitions and deals are completed. In this guide, we'll outline the acquisition process from start to finish, the various types of acquirers (strategic vs. financial buys), the importance of synergies, and transaction costs provides a high probability of leading to a reduction in costs and profitability as a going concern. 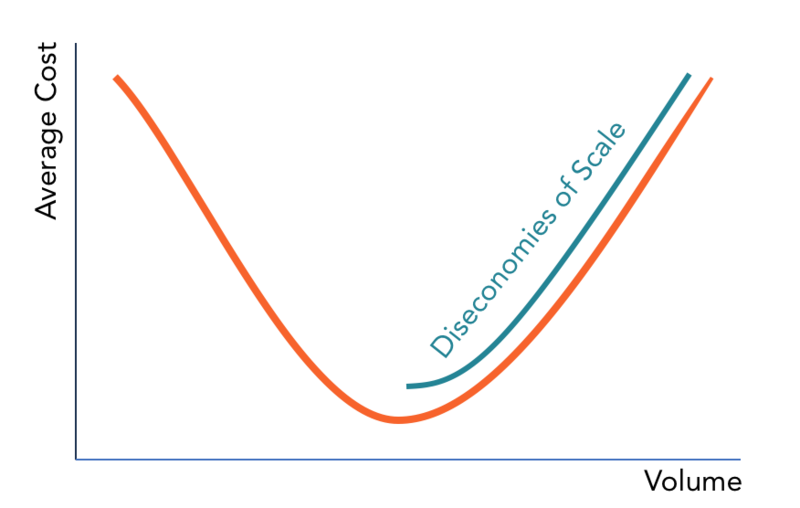 Diseconomies of scaleDiseconomies of ScaleDiseconomies of Scale occur when an entity is on the verge of expanding, which infers that the output increases with increasing marginal costs that reflect on reduced profitability. Economies of scale no longer function at this point, and instead of maintaining or reducing costs for the continuity of the business, the may result from several factors. The factors may include communication breakdown, lack of motivation, lack of coordination, and loss of focus in the management and employees. Diseconomies of scale may also be caused by the lack of proper coordination in a business where operational waste becomes the order of the day. It may also occur due to a mismatch between the various operations and the optimum levels of output. Communication is important in any organization, especially in managing economies of scale. A communication breakdown could be the beginning of diseconomies of scale and far-reaching adverse effects on the business like reduced profitability. During the growth process in any entity, an efficient communication channel is vital in the proper running of the business. Growth also poses more challenges in communication as the hierarchies change and increase. Increased layers of command can also distort a message as it travels upwards, downwards, or laterally. Where an organization relies more on written forms of communication such as notice board, newsletters, and memos, there will be a weakened communication system since written communication does not allow feedback. As the business grows, the employee base increases, which can make them feel isolated and thus less motivated. A small business employs a few individuals with a personal attachment to the business and a close working relationship with the owner and management. A large workforce with less interaction with the top management and can easily lose focus, leading to reduced profitability and diseconomies of scale. The effect of an employee in a large business can be less felt compared to smaller business. Diminishing employee motivation and loyalty often leads to decreased productivity levels and an influx of marginal costs. Solutions to low motivation can be empowerment, teamworking, and job enrichment. Empowerment involves the delegation in making decisions, which make lower ranked employees feel a sense of belonging. If an opinion of an employee counts in the daily running of a company, their motivation could increase, and creativity could significantly increase. Job enrichment involves making professions interesting and hence less boring. Many professions involve routine work, which makes an employee do the same thing year in year out in an 8-5 daily routine. The routine is boring, and one becomes used to the routine and can thus lose creativity. Making a job interesting could involve a rotation of roles once in a while, leaving room for creativity in professions and many others. Job enrichment can make professions interesting to follow if people are allowed to challenge themselves in their roles and hence improving the efficiency of operations. Teamworking involves the splitting of employees into teams with the goal of improving interaction at the workplace. Teams can consolidate people with varying ideas on how to perform different tasks, and it brings in fresh ideas into the team. Deliberation in teams on the best ways of undertaking certain tasks can significantly improve operations. A close link also exists between motivation and communication; thus when communication breaks down, motivation crashes head-first. Communication breakdowns can be controlled by the top management since they are high in the hierarchy and hence, communication heavily depends on them. As an entity grows in size, it becomes harder to coordinate the employees who, in turn, lose direction and motivation. Many employees are used to a routine, and face the risk of losing motivation and interest in the profitability of the business. Managers and supervisors also experience a hard time coordinating operations and ensuring that everyone is playing their part effectively. Businesses will be forced to hire or promote more supervisors to oversee the increased operations and monitor the performance of employees. The move will result in increased costs as the company gears towards optimizing its operations. The ideal solution to the loss of direction and lack of coordination is to delegate tasks and decision-making to the junior levels in the organizational chart. Delegating tasks and responsibility not only saves time but also equips lower level employees with better skills, rather than waiting for the higher levels of management to give direction on every task. Furthermore, delegation motivates junior employees to be innovative and creative since they move from being just executors of functions to core drivers of specific tasks. The initial introduction of machines in a largely manual system can also lead to increased costs. The system is used for human labor and shifting to mechanization especially on a large scale would complicate operations. If a company plans to mechanize its operations, such exercises should be introduced in phases to reduce the effects of diseconomies of scale. The machine operations and other employees should undergo training and take time to familiarize with the new systems before the actual date of mechanization. While transitioning from manual systems to a mechanized system may not be an easy task, this expansion and growth should be thought out by all stakeholders to identify all potential loopholes. Involving the stakeholders in the mechanization process helps reduce the effects of diseconomies of scale.